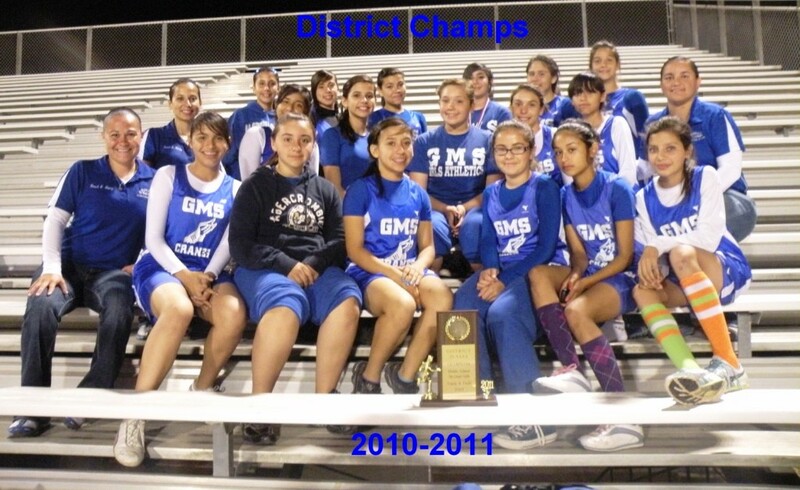 Grulla Middle School 7th grade Girls Track Team win the District Title on March 30, 2011 in Roma with a total of 174 points. Congratulations to the whole team for this great achievement. Team members include: Bottom Row: Coach Yadira Lopez, Esmeralda Ramos, Jackie Garcia, Alouette Gonzalez, Nayeli Resendez, Amalia Guerra, Elvira Alamillo, Middle Row: Coach Jayne Gomez, Julie Monsivais, Sarahi Garcia, Evelyn Zarate, Shelsie Hernandez, Stephanie Falcon, Coach Enedelia Rios, Top Row: Erika Salinas, Miranda Garza, Danielle Lopez, Arianie Lopez, Victoria Gonzalez, Yaritza Garcia, Not Pictured- Jackie Montalvo, Gabriela Sarinana, Ashley Cardoza, Stephanie Barrera. Special thanks go out to GMS administration, Mr. S. Trillayes, Mr. A. Ozuna, staff, parents, and community for their support during the season. Great job ladies, way to continue the tradition.